it didn't seem out of line to me. Vanuatu (retrospective). Not long after I introduced myself via kayak to other cruisers in our Lamen Bay anchorage on Epi, curiously, one of them hopped on her kayak and swiftly paddled to catch up with me. Her name was Agathe; a 20s-something French gal crewing aboard a neighboring boat from New Caledonia with a hunky-looking French captain. Agathe's English was far better than her captain's (and my) French, so she did most of the talking when I dropped by their boat. "Are you looking for crew?" she asked. From our earlier conversation Agathe knew we were headed back to Port Vila Vanuatu. "No," I replied, explaining Journey was a small boat, we were the crew. 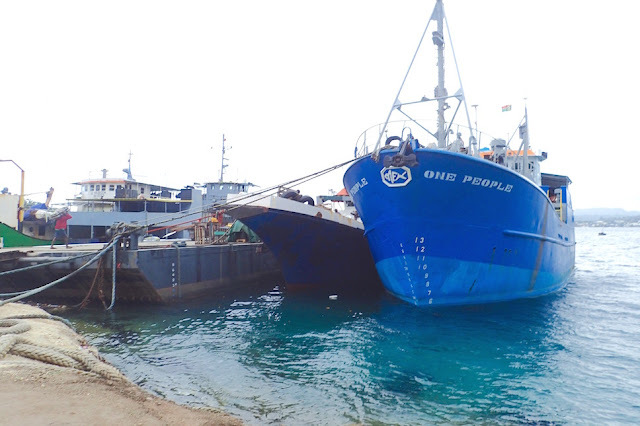 She shared that she was looking at taking the island's supply boat to Port Vila Vanuatu but it wasn't leaving until the morning... if she could get on. Then it dawned on me -- she really wanted to get off "her" boat, ASAP! I asked if that was the case and she agreed, emphatically. Sensing her urgency, and relatively confident in my husband's penchant for chivalry, I promised to check in with my captain right away about giving her a ride to Port Vila Vanuatu, noting I was pretty sure Wayne would be okay with it. While we didn't doubt her competence, we'd happily bring her her aboard as a guest rather than crew, as long as she was ok with our tight quarters. 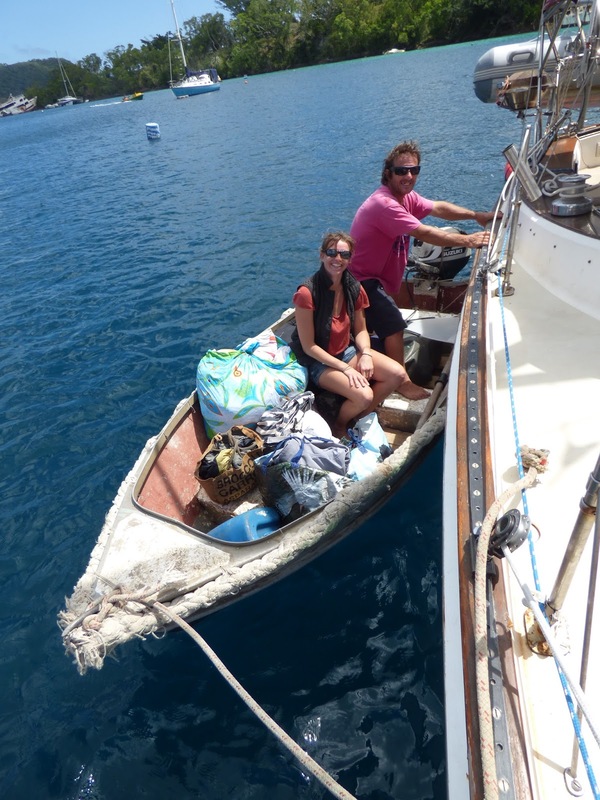 True to form, Wayne agreed we'd rescue Agathe, including Wayne's picking her up at "her" boat and ferrying her over with all her possessions. "Can you be ready within the hour?" we asked. That's when we planned to leave on our overnight passage to Port Vila, carefully timed to travel through reefy areas in good daylight, sailing through the safer open ocean through the darkness. Agathe agreed she would be; though it meant quickly gathering everything she brought aboard for her intended multi-month passage to and through Indonesia. Her "stuff" it turns out, was considerable, yet all together by the time we needed to set sail. to have someone's stuff besides mine taking up space (as Wayne is far more minimalist than me). I once desperately bailed early as a sailing crew member myself, and was reasonably sure that was one more reason Wayne would want to help out Agathe, too. In my case, the captain I crewed went into a depression as deep as the stock market crash that afflicted him during my cruise with him. My escape from the wilds of British Columbia took the form of a very long bus ride, followed by a ferry, then a hitched ride to Bellingham, where Wayne took off work early from Everett to drive the hundred or so miles to get me. 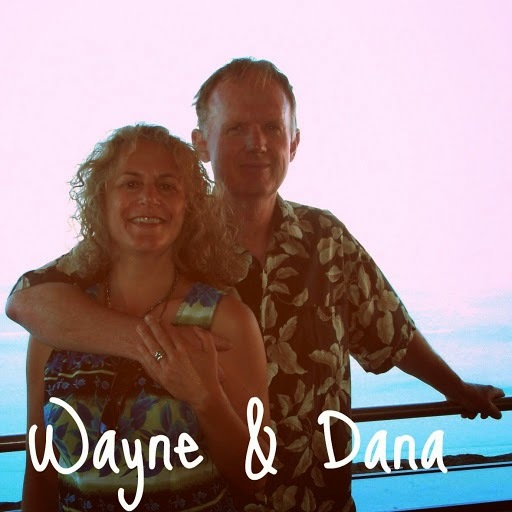 I still remember how relieved I was to leave, and for Wayne's help in making it happen. As when I "escaped" my crew captain, Agathe's relief at her escape was palpable. She slept most of the passage, despite our getting slammed repeatedly in 25 knot winds. When she was awake, she filled us in on why she'd wanted off that boat. She and the captain had been friends, and she agreed to crew only under the condition she was crew, not "friends with fringe benefits." As their trip progressed, and the captain came to understand she hadn't changed her mind about the nature of their relationship, he became overly controlling; repeatedly trying to convince her everything she did aboard was wrong. His behavior shut her down to the degree she retreated to her cabin, only coming out when absolutely necessary (or - in the case of Lamen Bay - to find a way off the boat). On a brighter note, Agathe entertained us with her adventures in New Caledonia, where she'd lived most recently, as well as her time traveling and working with competition show horses in Australia. Her sunny disposition blossomed by the minute. 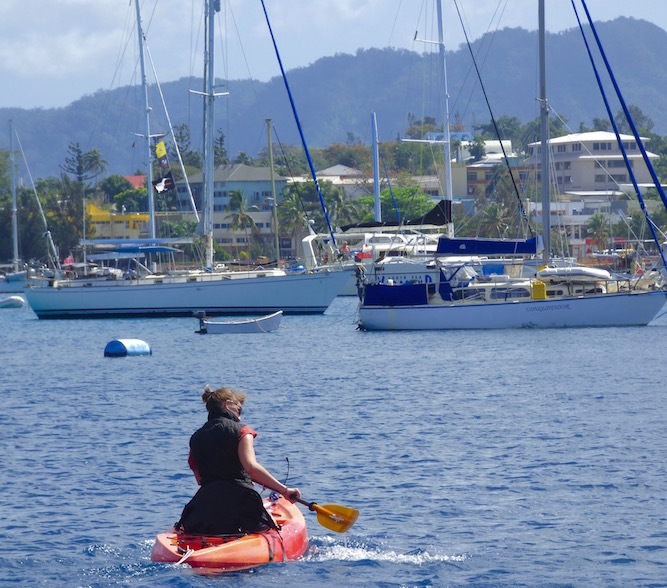 Agathe on Galley Wench Tales' kayak in Vanuatu, headed off to see which if her friends would her her a temporary spot for herself and her stuff. Fortunately Agathe's cruising friend in Port Vila had a good sized skiff ferry here and her stuff. Eventually we met Agathe again when she returned to New Caledonia, where she remains today, about a year later. There's no doubt in our minds that Agathe has what it takes to beat the odds on any challenges she encounters. We are grateful Agathe gave us a chance to pay forward a little of the incredible boat karma we've received from so many other cruisers, current and past, as well as many locals and expats. I hope you too you get the chance to rescue or at least assist another cruiser in some way shape or form, supporting the caring and vibrant community of those of us who cross oceans great and small. It is the foreshortening of distance between our hearts rather than the nautical miles we cross that make up the moments we will treasure the longest and most dearly. Ironically, the whole reason I introduced myself via kayak to our fellow cruisers in Lamen Bay was because I felt incredibly dissed when the three other boats in our prior anchorage socialized away for days without inviting us. I vowed to not do the same to other nearby cruisers in our future anchorages. You just never know what happens when you choose to put yourself out there, with a smile and an offer of friendship and assistance. we know our journeys are far from done. This post is a retrospective of our September 5-6 2016 stop in Lamen Bay, Epi, Vanuatu (S14.44.750 E168.18.729), aboard s/v Journey, our now former Pearson 365 sailboat. This is one of many stories left still to tell of our cruising halfway around the world, which ended in February 2017, and was followed by months of navigating Australia by Land Cruiser. Now back in the US, we are currently living aboard another boat in Portland, Oregon, aboard a lovely Puget Trawler, Serendipity (N45.47.449 W122.47.189). 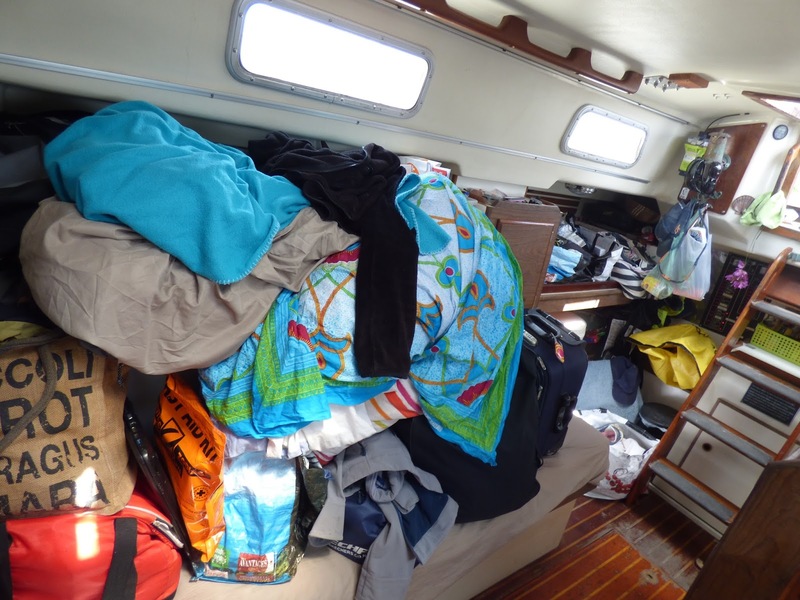 Our current live-aboard life is not without its challenges. This sign's been up for the "better" part of the last few weeks in our marina. Here we still are experiencing culture shock greater than we did in the 30 countries we traveled through cruising (part of the reason www.GalleyWenchTales.com posts slowed, along with working full time and the effort that it takes to re-establish when you come back without even a knife, fork or spoon). Perhaps what makes the US and Portland so strange is we expected life abroad to be different than "home." However we have changed greatly in the 7 years since we left Portland, and we are not alone in observing Portland has changed even more than we have. For now, my intent is to continue to fill in some gaps of our grand cruising travels in this blog, interspersed with a bit of what's happening now and answers to questions we're most often asked. We enjoyed getting out on Serendipity this summer in the Pacific Northwest (more posts in store on that). We anticipate more cruising and travel in our future, but exactly when, how and where are TBD. In another week I'll be flying out to Florida to help my Dad and his wife transition into a memory care facility; a reminder of the importance of finding ways to be there for family and the preciousness of life. Pacific Puddle Jump: Yes or No?